Recently we had the chance to test Tourmaster’s Cortech GX Sport jacket, which we would put into the “all-around” riding jacket category. The first thing you notice when picking up the GX Sport is the weight. While not excessively heavy to the point of being uncomfortable, the GX Sport is definitely a beefy piece, especially with the removable liner installed. The shell is constructed from 600 denier Carbolex material, with likely impact points (elbows, shoulders, back) reinforced with 1680 denier ballistic polyster material for extra protection. It also features a built-in heavy duty foam back protector, as well as heavy-duty foam pads on the shoulders and elbows. To top off the protective capabilities, the elbows feature built-in semi-rigid elbow guards. 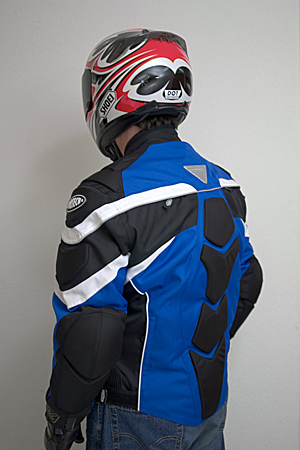 Despite all this armor, the GX Sport is a remarkably comfortable jacket. 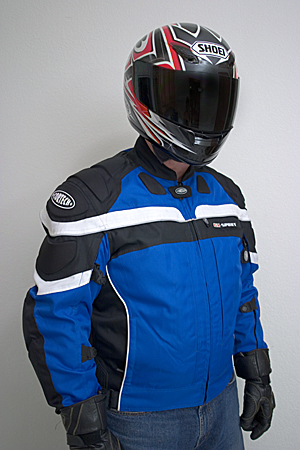 After riding for a few miles, you simply forget you are wearing it. While this seems like a simple statement, it stands as testament to the impressive design of the GX Sport. The precurved fit is spot-on, never riding up or getting bunched as you move around on the bike. Neither does the high collar chafe at your throat when you tuck forward into a sport-riding crouch, as some jackets do. Testing the GX Sport during a surprisingly cool Southern California winter didn’t give us much chance to evaluate the jacket’s ventilation system, but in the small amount of time the vents were open they seemed to work exceedingly well. Although I don’t think it would be the jacket of choice for a 100+ degree SoCal summer day, anything less severe and the GX Sport would definitely be adequate. With the removable liner zipped in and all the vents closed tight, the GX Sport is extremely warm. The close-fitting liner keeps cold air from swirling around next to your skin and sapping your body heat, making for a comfortable ride even with temperatures in the high 30s. The most remarkable thing about the GX Sport is the price. After testing the jacket for two weeks, I only discovered the price when I sat down to write this review. When I saw that the GX Sport’s MSRP was only $150 I was stunned – I had expected it to be priced significantly higher, perhaps even double that, based solely on the quality and comfort of the piece. If you’re looking for a tough, well-armored textile jacket for all-around, everyday use – at a great price – look no further than the GX Sport. You can find more information, and a list of dealers, at Tourmaster’s web site.